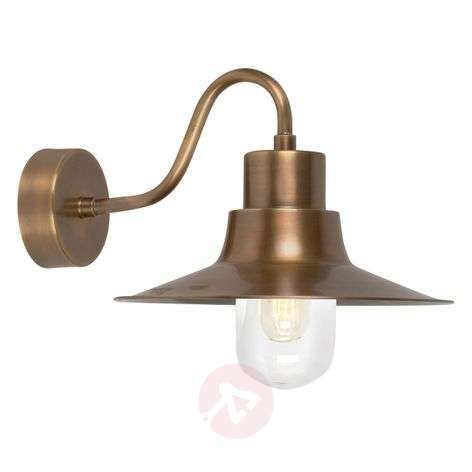 The outdoor wall lamp Sheldon is traditionally made from brass. The wide metal lampshade is attached to a curved arm and is supplemented by a clear glass lampshade at the bottom, which allows you to see the light bulb and allows the light to shine through brightly. A decorative light bulb in a vintage style or with a carbon filament look (see Accessories) appears particularly attractive. The surfaces of all the brass parts have also been waxed to provide protection from the weather. In order to protect the glass lampshade, a protective basket made from brass can be ordered as an accessory.